FIFA’s biggest sponsors have put pressure on the association to convince Qatar, which is hosting the 2022 World Cup, to improve poor labor conditions for migrant workers. Sponsors to speak out include Visa, Adidas and Coca-Cola. “We continue to be troubled by the reports coming out of Qatar related to the World Cup and migrant worker conditions,” Visa Inc. said on Wednesday, noting its “grave concern” directly to football's governing body. Footwear giant Adidas said it is in “constant dialogue” with FIFA, stressing existing efforts. “There have been significant improvements and these efforts are ongoing, but everyone recognizes that more needs to be done in a collective effort with all stakeholders involved,” the company said in a statement. Coke also issued a statement, putting additional weight on the association: “We expect FIFA to continue taking these matters seriously and to work toward further progress,” the company said. The three sponsors collectively invest around $30 million on an annual basis, according to FIFA’s financial accounts. But Qatar insisted it was “committed” to improving conditions for more than 250,000 migrant workers. A statement from the Ministry of Labor and Social Affairs said that over the last 12 months reforms had been put in place to improve the conditions for migrant workers. "Significant changes have been made over the last year to improve the rights and conditions of expatriate workers. No one should be in any doubt that we are committed to effective and sustainable change," read the statement. The Ministry added that reforms already in operation included an electronic wage protection system to make sure workers get paid on time and improved accommodation. The number of labor inspectors is also due to be increased from 294 to 400 by the end of the year, while 51,000 site inspections were carried out in 2014, the Ministry said. The mounting pressure on the football association follows the release of the latest report by Amnesty International, which accuses Qatar of failing to introduce the promised reforms for migrant workers, who continue to die in the hundreds due to poor labor conditions as preparations for the 2022 World Cup continue. Amnesty International reported that around 440 migrant workers from India and Nepal died in 2014 alone. 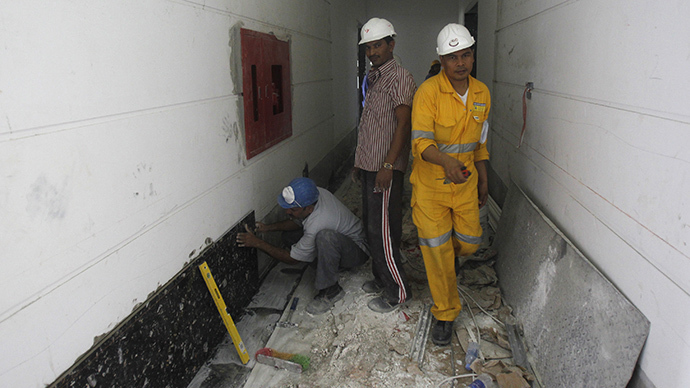 “Qatar is failing migrant workers,” Gulf migrant researcher at Amnesty, Mustafa Qadri, told AFP. “Last year the government made promises to improve migrant labor rights in Qatar, but in practice, there have been no significant advances … The lack of a clear roadmap of targets and benchmarks for reform leaves serious doubts about Qatar's commitment to tackling migrant labor abuse,” Qadri said. On top of the concerns with the treatment of foreign workers, Qatar also faces allegations of corruption when it came to its World Cup bid. At the beginning of May, journalists from Germany’s biggest television networks were detained and questioned. Reportedly, the individuals were not allowed to leave Qatar for days while working on a story about FIFA President Sepp Blatter and Doha’s vexed nomination for the 2022 football World Cup.